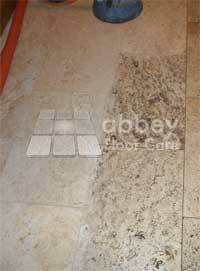 Are your dirty tumbled travertine tiles giving you sleepless nights? 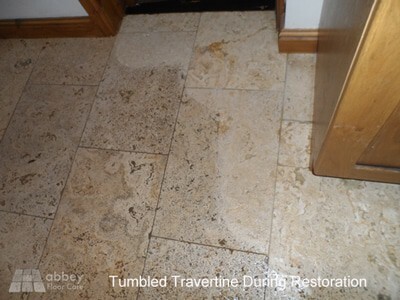 We have had plenty of customers who were ready to tear up their tumbled travertine flooring because they just could not get it clean. It is a story we hear often of how the tiles looked so beautiful in the store and even better when they were laid, justifying the significant cost of the flooring. However after just a short time the floor started to get dirty and soon becomes impossible to clean. The holes that make this kind of travertine so attractive are the main cause of the problem. Over time they fill with dirt and soon the floor itself looks dirty. No matter how hard you try to clean the floor, you just can’t get the soil out of the holes. You also have the issue that over time, new holes start to appear and the shadow cast by deep holes look just like black dirt, even when they are clean. Also over time abrasive grit and dry soil wears the surface of the new stone wears, leaving scratches and small holes where different size stone particles break off the surface. This pitted, scratched surface fills up with dirt, leaving ugly black spots all over the floor. Cleaning with a mop and bucket will not clean this dirt away. Once your floor has got to this state, the only way you are going to get it clean again is to clean out the holes with pressurised hot water, just like using a mini jet washer on each hole. We call this kind of cleaning “clean and capture”. The equipment we use equipment that will clean out the dirty holes with high pressure hot water. The beauty of this equipment is that there is no messy over-spray. All the cleaning is contained in the head of the machine. 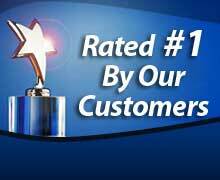 It is also particularly good at removing ingrained dirt in the tile grout areas. This picture perfectly illustrates the effectiveness of “clean and capture” cleaning. The dirty floor looks really bad and our customer was embarrassed to invite people into her kitchen. This is such a shame, as the clean area demonstrates what a beautiful flooring tumbled travertine can be if it is clean. Once we had thoroughly cleaned and dried this floor, we filled the large holes with colour matched grout. Finally we applied a hard wearing acrylic surface sealer. When a tumbled travertine floor has been properly sealed, it is surprisingly simple to keep it clean if you use damp microfiber cleaning. However if you use normal mopping with a cotton mop, then your floor will get dirty again quite quickly. Because cotton mops push dirty water into the holes. Whereas a damp microfiber mop absorbs the dirty soil into its fibres and not into the holes. If you want to find out how to get your floor clean again and keep it clean call 0800 695 0180 and we will be happy to help you.